I’m a staunch defender and pro-active advocate for the jurisdiction. 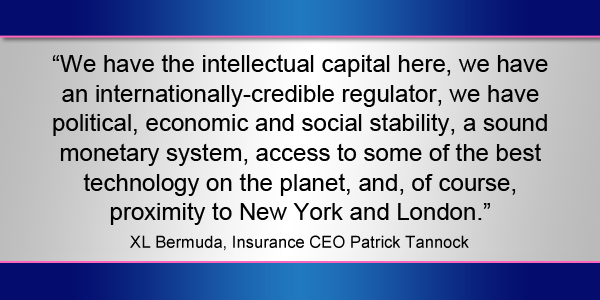 I genuinely believe in Bermuda’s undeniable value as a blue-chip international financial centre. Yet that message has even greater resonance coming from currently practicing industry executives—those who have chosen Bermuda as a domicile from which to wield a powerful global corporate impact and who believe in Bermuda’s strengths because their own companies depend on such competitive advantages. This month, as part of our ongoing reputation management, the BDA launched into production of a US-facing educational campaign. Aimed at senior executives—and those who influence them—the campaign goals are to inform those with scant knowledge of the island, change negative perceptions, and develop positive views of Bermuda among companies that might consider establishing operations here. We are emphasising Bermuda’s strengths through testimonials—comments and facts delivered by real Bermuda-based business leaders that reflect their views of Bermuda and why living and working on the island is beneficial. Their remarks will be used in myriad ways, including op-eds, case studies, white papers, videos and video shorts, all delivered through a compelling digital platform. We are very pleased to have the support and participation of numerous top-level executives in our market. These are highly respected corporate stakeholders, and as we filmed the video portion of our campaign this month, they also proved no slouches at elucidating what they feel are Bermuda’s most positive attributes. So, how do they describe Bermuda as a place to do business? “Two words: world-class,” said Brian Duperreault, Chairman and CEO of Hamilton Insurance Group, formerly CEO of ACE [Chubb] and Marsh & McLennan [and speculated by analysts as a prime head-hunting candidate to run AIG]. When legendary corporate superstars of this calibre talk about Bermuda in such glowing terms, it makes for an immensely persuasive proposition. 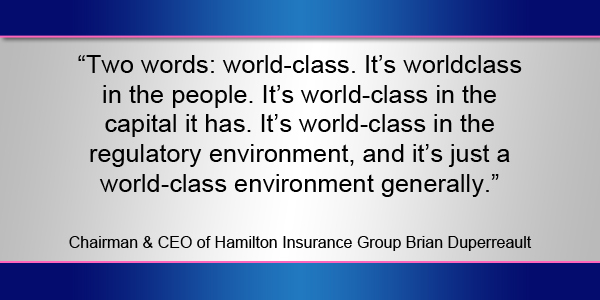 “It’s world-class in the people. It’s world-class in the capital it has. It’s world-class in the regulatory environment, and it’s just a world-class environment generally,” Duperreault continued. Former BDA director Allison Towlson, a Senior Vice President at Chubb Bermuda, is another straight-shooting Bermuda booster. Chubb began life in the City of Hamilton as the excess liability insurance trailblazer ACE over three decades ago, and today has offices in 54 countries around the world. What does she think business leaders in the US need to know? Renaissance Re’s Group General Counsel Stephen Weinstein, a current BDA Board member, extolled the quality of the island’s human infrastructure. “Our whole business is about talent,” he pointed out. “Reinsurance equates to a portfolio of risk and matching pool of capital managed by a talented team; without the talented team, the capital’s worthless. Patrick Tannock, Chief Executive Officer, XL Bermuda Ltd, Insurance and Chair of the Association of Bermuda International Companies [ABIC], was another participant whom we were delighted to welcome on board our advocacy bandwagon. “We have the intellectual capital here, we have an internationally-credible regulator, we have political, economic and social stability, a sound monetary system, access to some of the best technology on the planet, and, of course, proximity to New York and London,” Tannock noted. 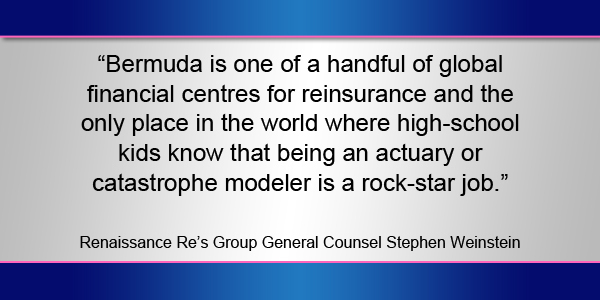 Okay, so Bermuda’s insurance industry heavyweights are right on message, but what about new sectors, cutting-edge industries, the disruptors? What do they have to say? 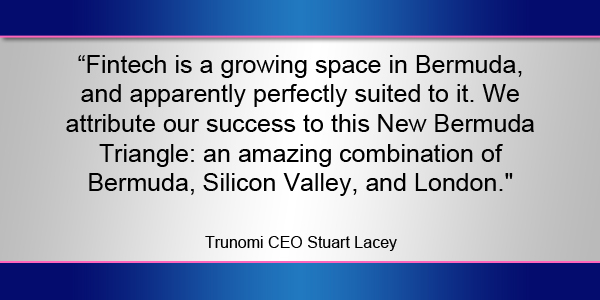 “Trunomi was founded in a really supportive environment with all the key ingredients we needed: access to capital, access to talent, and access to world class distribution,” said Stuart Lacey, CEO of the multi-award-winning fintech start-up, which commands a birds-eye view over Mills Creek from its fittingly contemporary offices. And the newest arrivals, the ones just settling in? It was gratifying and very encouraging to hear Dr Angelos Stergiou wax lyrical about what he’s discovered here in less than a year. 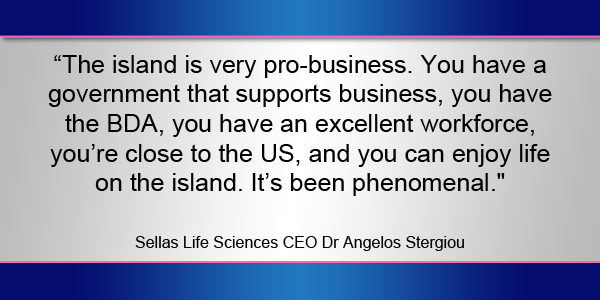 Stergiou is CEO of Sellas Life Sciences, a pioneering cancer-therapy biotech which moved its headquarters from Switzerland to O’Hara House on Bermudiana Road at the end of last year. How does he feel Bermuda compares to other jurisdictions? Naturally, I agree. 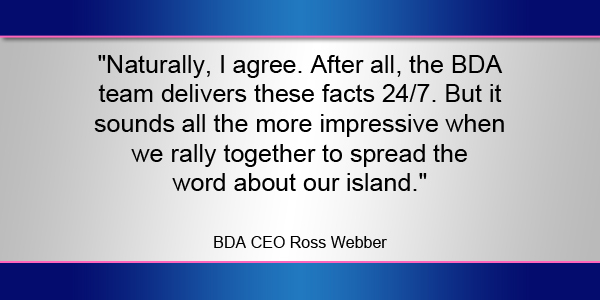 After all, the BDA team delivers these facts 24/7. But it sounds all the more impressive when we rally together to spread the word about our island. And the more motivated, enthusiastic and credible industry advocates we can encourage to speak out, the more powerful that Bermuda message will be. Great work BDA. Keep up the non-partisan, proactive, positive and productive vibes.